Just sitting here drinking my morning coffee and getting ready for the day. I have to work today, I had a sick little boy Friday and didn't get a thing done. But before I get out to the studio, I thought I would give you some great links to check out. It's hard for me to write a post and not show a picture. I guess it's the artist in me, I am a visual person. So here's my picture. This is a new charm bracelet that I have been working on. It will be one of my new kits. I am working on packaging them today. I got some really cute boxes and ribbon and oh they are going to be cute! As soon as I get some finished I will post a photo. In the meantime, enjoy your coffee and check out these other great beader's links. About.com Jewelry MakingWire is a great medium for jewelry making, and with this new DVD review you can find out how you can turn straight wire into super cool bangle bracelets. Art Bead SceneObsessing over details leads Cindy Gimbrone to revise her MF Bird. No, she’s not frustrated she means Modern Folk Bird. Jennifer Jangles BlogSee the first ceramic beads Jennifer made. 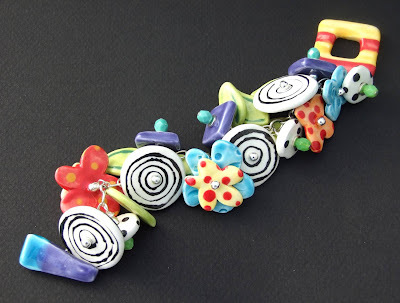 Jewelry & BeadingWhat to do with those odd-shaped treasures you pick up on vacation this summer! Katie’s Beading BlogFeeling the economic pinch in your purse? There are plenty of ways to make cool jewelry with stuff you already have. Naughty Secretary ClubSo many social networking web sites and so little time. Find out how Jen utilizes websites like My Space, Indie Public, Twitter and more to help promote her jewelry business Naughty Secretary Club and spread the crafty gospel. Snap out of it Jean! There’s beading to be done!Margot will be posting in a cool crafting group but still visiting here. When I get the url, I will post it for that group. Until then, check out this repost of her fantastic pocketbook which I adore and treasure she made me!